After a few spins, Johnny pulled into shore so Shads could take a turn. Matt stood in the shallow water of the shoreline, pushing the Jet ski out onto the lake horizontally in front of him. I noticed Mike speeding toward shore as if he planned to do a drive-by and spray Shads with water, but it seemed like he was coming in a little too close and a tad too fast. I figured he knew what he was doing, so I turned back to the BBQ, but a few seconds later I heard a loud CRASH. My heart dropped because I was convinced of what had happened: Mike Portnoy had just killed his bandmate. 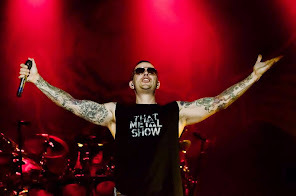 Time stood still and I could see the headlines on Blabbermouth.com already: M. SHADOWS DEAD IN BIZARRE JET SKIING ACCIDENT AT CHRIS JERICHO’S HOUSE MIKE PORTNOY REPLACES DRUMMER, KILLS SINGER. The way Matt had been pushing the ski out in front of himself, I was certain Portnoy had lost control and rammed into him, crushing him between the Jet Ski and the stone wall that separated the lake from my lawn. I was expecting to see him torn in two halves with his torso on the lawn, and his legs sticking up like bloody pipe cleaners between the barricade and the boat. But when I turned around, Matt’s legs were, thankfully, still attached to his torso and he was standing on them.